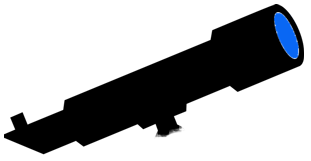 Click to start your new Website! Website Design for Cambridge & the Universe! 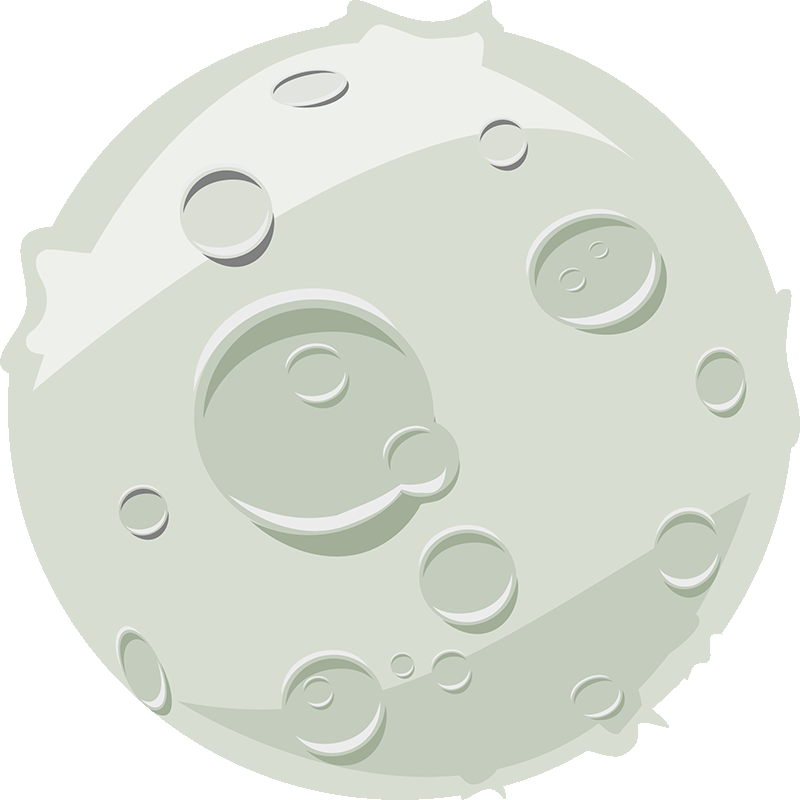 Your website is a window to the entire planet, so you need a Website Designer who completely understands your needs. Good responsive website design is the single most cost effective way of telling the world what you do and how well you can do it. We specialise in clean responsive website design for clients in or around Cambridge. Clients who just want to get it done with no fuss, mind boggling jargon, or overpriced and inflated packages. business needs, branding and budget. Intuitive and informative modern website design for business, organisations & individuals. Clean and usable website design with an emphasis on client service and the best end user experience are key to every project we complete. From on-line shops to galleries and portfolios, every site is bespoke and our service completely focused on our clients. A simple range of hassle-free managed hosting options, including email.  Choosing a hosting package can feel like shooting in the dark. We offer a simple, secure and economical option that suits your site, with no unnecessary costly extras. We will get your site up & running and make sure it stays that way! We offer a comprehensive client support package for all of our projects. Great website design is just the beginning. For your website presence to be successful, you may need a little help from time to time. We can offer as much or as little support as you require including Technical, Security, Website Design, Back-ups & Alterations. We don’t say goodbye once your site is live! Website Design integrated with your Social Media. Connect your social world to your website. Complete website design integration means you only need to post something once! 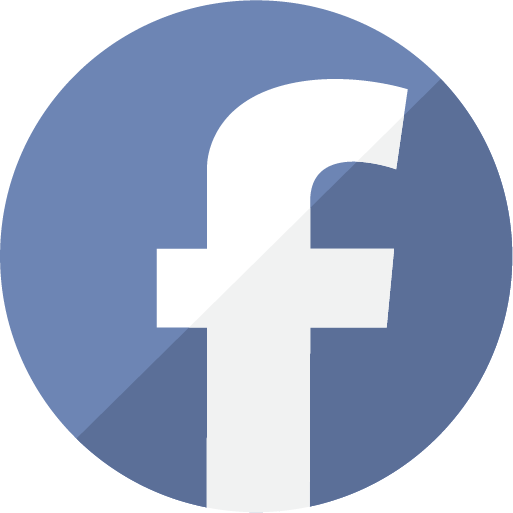 Like, share and post, all from your site! Let your website inform your social media outlets and in turn, drive more traffic back to where your sales are made – Your website! Content Management Systems (CMS) - Change your own content, easily. Content Management Systems (CMS) allows you, the site owner, to create and publish content to your site without any knowledge of web programming. Add or remove text and pictures or change prices as easily as using a basic word processor. All of our website design projects fully incorporate CMS functionality. All of our website design projects are designed from the ground up to be fully responsive. More than 70% of website visits are made from mobile devices. This increasing trend means it’s essential that your website design looks good and is easy to navigate, whatever device you view it on. Every website design we create is responsive and will adapt seamlessly to your user’s device and screen size, ensuring your message looks great and remains clear. We’re very proud of the website design work we do for our clients and we’d love to share it with you. Here are some of our most recent projects. Select each one to learn a little more, or visit the site. I very much enjoyed the process of creating my website in collaboration with Luke. He understood and delivered on the simple, crisp aesthetic that I was after and didn’t try and foist the latest moving zooming picture formats on me! He managed my input very well providing a good balance of cajoling, encouragement and deadlines in order to get me to provide enough material for my case studies. Amanda Fuller. Owner, Amanda Fuller Garden Design. 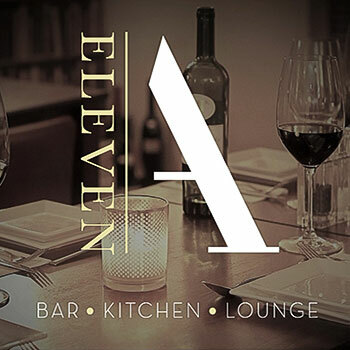 Eleven A is a stylish new Cocktail Bar & Lounge located in the heart of Ely. Luke has been great throughout the whole process of our web design. From the outset he has guided us through the process, offering suggestions and ideas which made the whole process much easier and trouble free. We are delighted with the end result and enjoy our ongoing working with him. David Toulson-Burke. 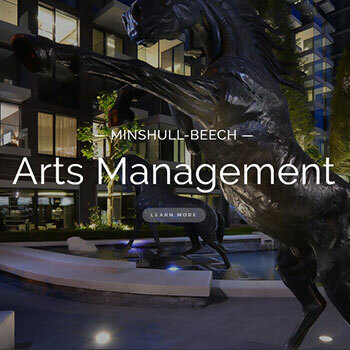 Owner, Eleven A.
MB Arts Management is a public art consultancy, working with developers, architects and landscape architects to enable and facilitate the delivery of art in the public realm. Luke was recommended to me by Verve Financial at a time when I needed a complete overhaul of my website. He is a talented visual designer, inspiring, confident and able to get to the heart of my business vision to create dynamic and attractive shop window. I am also delighted to have ongoing web support with the opportunity to keep the site active and current. 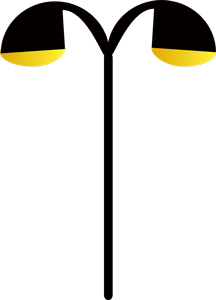 Luke’s business also offers web hosting and we are working to move everything together into a properly managed portfolio. I can highly recommend his expertise, vision and business support. Nancy Minshull-Beech. Public Art Consultant. 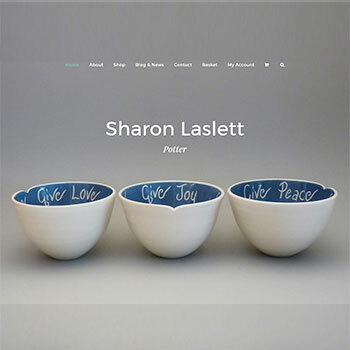 Sharon Laslett is an extremely talented potter and artist based near Royston, Cambridgeshire. I had a very definite style in mind for my pottery website and Luke seemed to tap right in to it creating exactly what I wanted: a simple, clear and easy to navigate website that looks stylish and professional. As a professional himself Luke is a pleasure to work with being both incredibly efficient and helpful, and, I might add, has a great sense of humour! I have received very positive feedback from fellow potters and customers alike and highly recommend Luke’s creative services. 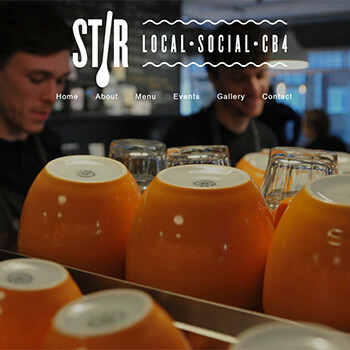 Stir is a trendy cafe located in the exclusive Chesterton Road area of Cambridge. We created a clean, minimal site to reflect their branding identity whilst giving a flavour of their modern and vibrant business space. We needed a new and more professional website design that truly reflected our brand. We therefore engaged the services of Luke and from the start, could not have been happier with our decision. Having given Luke very little initial input, the result was fantastic. He has designed a website that is professional, accessible and most of all, markets our brand in the best possible way. He trained our staff in how to edit the site and is happy to make ongoing changes, however small or trivial they may be. I feel that as a small business, having partners & suppliers that you can work well with and trust is critical. This is certainly the case with Luke and I couldn’t recommend him highly enough. 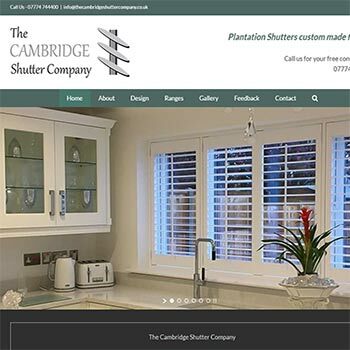 The Cambridge Shutter Company builds and fits luxury bespoke Plantation window shutters. I had been considering redesigning my website for a number of years, but never really knew where to start, I only knew that I didn’t want to work with one of those companies that are constantly harassing you by email trying to get your business. Hard selling is something I detest and a technique I never employ in my own business (which thrives on repeat business and recommendations). 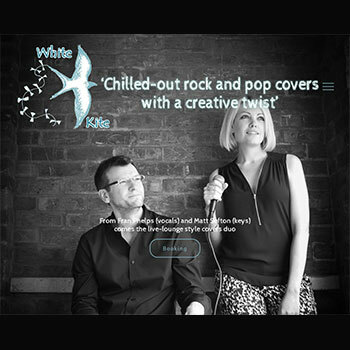 I was recommended to use Luke by a customer of mine that had recently started her own business and when I looked at her website I knew that he could produce something very slick and well designed to suit the high end products we offer. As a designer myself, I had quite a few ideas, although I am not very technical when it comes to using computers, so it was great to be able to sit down with Luke to discuss what was possible. He was very patient and was able to develop those ideas even further and came up with some really interesting options for us to include. I am thrilled with the outcome, My website has it’s own strong identity which makes it stand out from all of my competitors websites. Business increased significantly, and we get great feedback from our new customers who are able to navigate the site with ease. Luke’s company now hosts my website too, which makes it very easy for changes to be made as required. 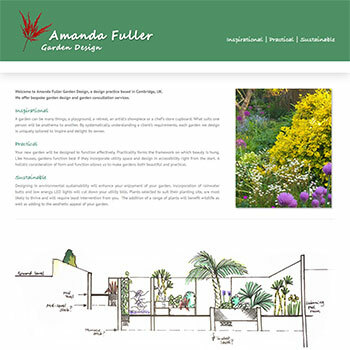 He also undertook some work designing exhibition panels, which we used at The Cambridge Homes and Gardens exhibition back in September; they really complimented the website and looked fantastic. Rebecca Mason. CEO, The Cambridge Shutter Company. 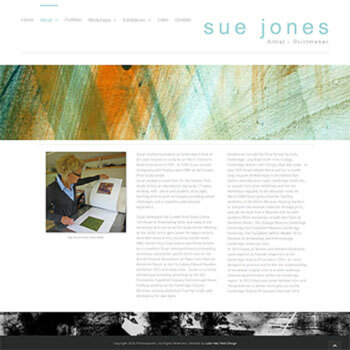 Sue Jones is a highly acclaimed and accomplished print artist based in Cambridgeshire, specialising in stencilling and planographic printing processes. Her original work is available her website. As an artist, I am naturally critical of everything I look at and read. To display my work in a context which is sympathetic to my style presented a challenge which Luke embraced and excelled in from the very start. He worked conscientiously and was able to create a website design which exactly captured what I had envisaged. He communicated with me closely throughout and was able to suggest ideas and solutions which greatly helped my own thought process and made the whole experience a pleasure. Trustworthy, reliable and talented – a pleasure to work with. Highly recommended! Amanda Wilson excels in teaching yoga techniques, from beginner to advanced classes, including specialised pregnancy yoga. Based in the south of England east of Winchester. Simply delighted! Luke Hall Website Design has brought my yoga teaching to life and my classes are selling out fast! Clients tell me how nice and easy it is to book into classes; using the live diary my clients book multiple events and dates for themselves and for friends. Luke Hall’s design is attractive and functional. The live diary is incredibly useful as it continually organises my class times and sizes with minimal administration; it saves me loads of effort and time, brilliant! I’ve never had a website before and I wanted one to help grow my yoga teaching. I had a clear vision of how I wanted my website to be and I was amazed by how easily and quickly Luke Hall understood and implemented my wishes. Every idea I had was considered and actioned, even to the minutest detail. 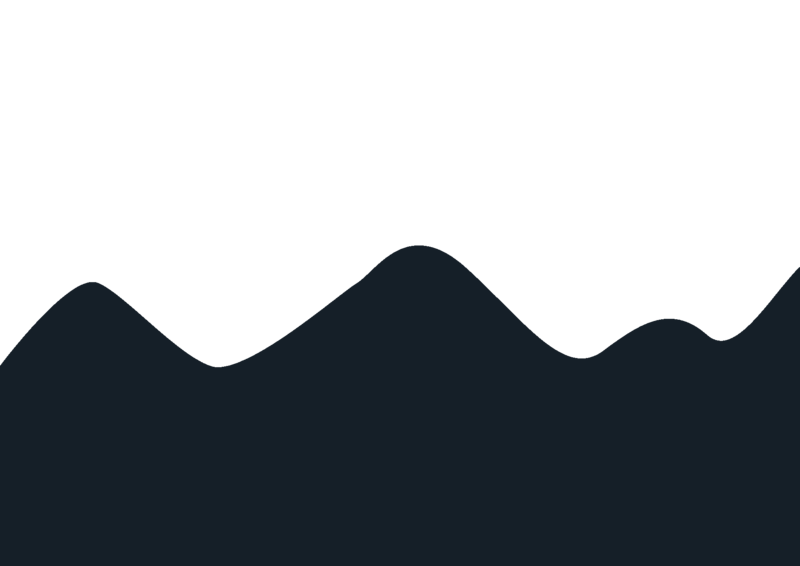 I want to thank Luke Hall Website Design here for being always ready to assist with the teething problems encountered when my website was launched. There were some initial errors with the class booking system and these were dealt with immediately and successfully. I highly recommend Luke Hall Website Design! 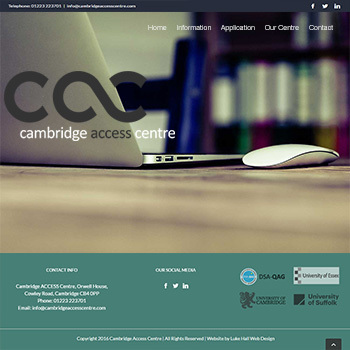 Cambridge Access Centre is a thriving Cambridge based company providing a disability assessment service for students wishing to apply for a Disabled Student Allowance grant. Our brief was to develop a website design that is student friendly, functional, eye catching, highly visible and easily navigable. Luke provided us with just that, incorporating all of these features and more. Our web site is the end product of an ongoing process that involved consultation and co-operation at every stage. Luke was willing to listen and take on board our particular needs. And as the majority of our visitors are students, our mobile enabled design with integrated content proved to be very useful. Luke is a pleasure to work with – always available and willing to offer honest advice and constructive suggestions, and to make changes as and when necessary. This allowed us to make confident and cost-effective business decisions on website development. His response is always professional and quick. Thoroughly recommended. 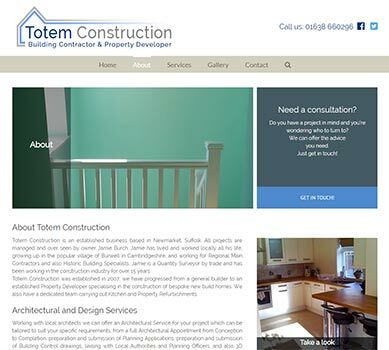 Totem Construction are a Cambs based builder and renovation company specialising in ultra modern conversions and renovations. 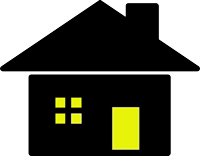 They are a family run business with an emphasis on excellent customer service. We needed to update our website to a more professional design to ensure we were attracting the right customers. We gave Luke the basic information about the company and left him to it, and we are really pleased with the results. He has designed a website that is professional, modern and has already had a lot of very positive comments. We would definitely recommend Luke for website design and hosting. Jamie Burch. Owner, Totem Construction. 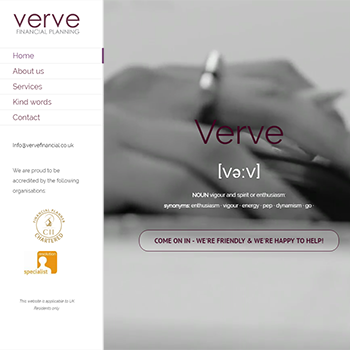 Verve Financial Planning is an independent company of Chartered Financial Planners based in Cambridge. Their brief was to create a modern, clean & professional website for business development. Click to visit. We were given Luke’s name from an existing client of ours. We needed a website design for our new venture, and although we had ideas about written content, we were unsure of the layout and design. We gave Luke creative carte blanche to design something for us that was simple and welcoming but classy. He delivered a stylish website, on time and within budget, which was no mean feat given the compliance requirements for financial services. He went out of his way, on several occasions, to make sure that we were happy with the content, and even took our photos for us. We are completely delighted with the result, and we have received many compliments about our site. We would certainly recommend him, we can’t sing his praises highly enough. Stephanie Clark & Fiona Sharp. Directors, Verve. 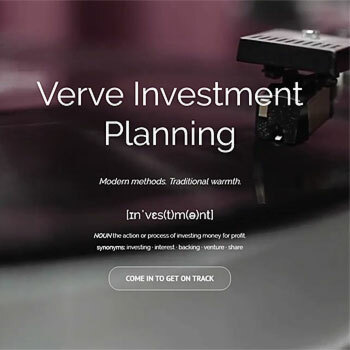 Verve Investment Planning is part of the Verve financial group based in Cambridge. Their brief was to create a modern, clean & professional website for business development, whilst maintaining the branding elements of its sister site. An interesting twist is the musical theme! Click to visit. As a first point of contact it is vitally important that a Website design reflects the business and the people involved in it. Achieving that can be fun, but stressful. Well, Luke enhances the fun and removes the stress – all whilst delivering an incredibly professional result, on time and within budget. I cannot recommend him highly enough. Steve Buttercase. Principle, Verve Investment Planning. 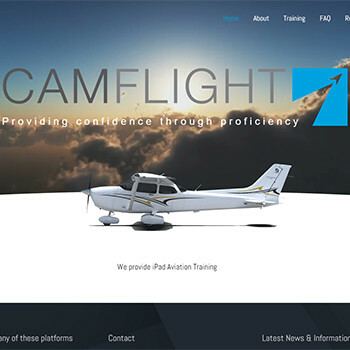 Camflight provides specialist training for pilots. Their niche market exists within the highest echelons of the aviation business, catering for high value clients throughout the UK and U.S. Creating exactly the right professional image is essential to our business and good website design is a crucial part of that process. From the start Luke understood the importance of our branding and the technical elements of our work and translated them into a website that far exceeded our expectations. Luke has responded quickly to all that we’ve asked of him and has stopped at nothing to deliver everything in our brief, whilst remaining completely flexible. I’d highly recommend him to anyone looking for a new website. Arwyn Jones. Head of Training, Camflight. Vintage Flying are a UK based company offering unique flight experiences in vintage aircraft. 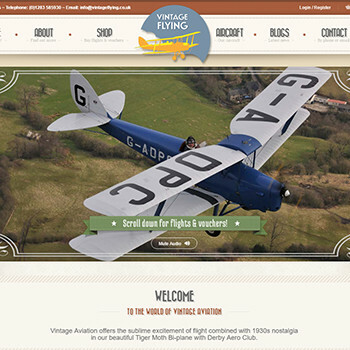 Our brief was to create a site with a vintage theme to show off their aircraft and portray their passion for flying. Creating the right look was an essential part of our brief and Luke got it absolutely right. Our site is full of images and technical narrative and Luke was able to integrate everything, including our online shop seamlessly into the final website design. He always made a real effort to complete each stage of the project quickly and efficiently, whilst keeping us informed of progress each step of the way. No effort was spared when guiding us through the process and he responded to our questions immediately every time. Highly recommended for anyone needing a business or personal website. Paul Ford. Owner, Vintage Flying. Your new website is just a few steps away! If you’re new to the mysterious world of website design it may seem like a daunting task. Don’t be put off – we will guide you through the entire process and ensure that your finished website is something you’ll be proud of. Our websites start from just £399 which includes a full design, consultation and deployment service. To build your new website, or to revamp your existing one, we’ll need to get a feel for the kind of things you like about the internet and ultimately, what you’d like your site to look like. At this stage you may not know what you’d like, or how to visualise it. That’s OK and not at all uncommon, so we’re very well practised at working with our clients and helping them to nurture their ideas. Our first job is to complete a ‘Creative Brief’ which is just a handful of questions for you to answer. It will only take a few minutes and your answers will create a basis for us to design your site and to provide you with a fully priced proposal, which you may read, ponder and suggest alterations to before we start. For quotations, consultations or just a chat about you and your web design requirements, please drop us a line!